Prepare to get enlisted again, as Sniper Elite V2 Remastered is coming to the PS4, Xbox One, PC, and Nintendo Switch sometime in 2019. The series is known for its x-ray kill-camera shots, and Sniper Elite V2 Remastered has made them even more brutal with new graphics and rendering technology. Now, you can see the bullets fly through an enemy in brilliant 4K and HDR. Rebellion has added a modernized renderer, as well as new post processing effects, better level geometry, more detailed textures and particles, and a new lighting system, so the brutal kill shots should look better than ever. To add to this new look for Sniper Elite V2, eight new characters from the Zombie Army series of games have joined the roster of soldiers to play in both the single player and multiplayer modes (Deathmatch, Distance King, Dogtag Harvest, and Capture the Flag). The number of players within a multiplayer game has also been upped to 16. For those who want to snag a picture of their kills (pretty morbid, but okay), the photo mode allows you to pause and scrub through the kill frame-by-frame to get exactly the right moment, line up the shot with perfect positioning, apply a filter, adjust the lighting, and snap for a nice battlefield memento. X-ray kill-camera shots are fair game too with this new mode. 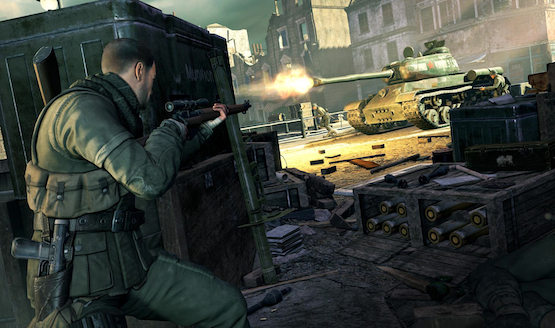 Rebellion also announced that a Sniper Elite VR game and a sequel to Sniper Elite 4 are in development. A live stream will provide additional details about these additions to the series. Sniper Elite V2 Remastered was first spotted on the Australian Classification Board last December with a rating of 15+. The Castlevania Anniversary Collection was seemingly outed by the same ratings board this week, and the confirmation of Sniper Elite V2 Remastered lends a lot of credibility to the Castlevania announcement.